Blue Jays area common species, but what do you know about their migration? Photo by Michaela Fotheringham via Birdshare. Location: Look for hilltops with a good view or woods near natural barriers. Even fairly small lakes or rivers present an obstacle to forest birds. Consistency: Pick a place and make it yours. Repeated visits help you learn what’s normal, eventually revealing what’s not normal. Behavior: If you see birds doing something new, look for the reason. “Usually you don’t see local birds in sustained flight over the tops of trees— usually they’re in the trees,” Wood said. That can be a clue you’re seeing migrants. Recordkeeping: Wood can still recall the great Blue Jay migration of 2010: 2,486 in one morning. Or a November 1999 count of more than 1.25 million American Robins in Cape May, New Jersey— but only because he kept notes each day, revealing patterns over time. 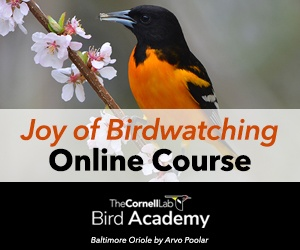 Sharing: Citizen-science projects like eBird and Project FeederWatch are a great way to instantly pass your sightings along to the scientific community, where they can become part of something larger. Ah, fall migration! Skeins of geese, confusing fall warblers, winter sparrows. Blue Jays. “Most people don’t even think of Blue Jays as being migratory,” said Chris Wood, co-project leader for eBird at the Cornell Lab of Ornithology. Though many jays do stay put for the winter, some individuals head south, a pattern called partial migration. Uncovering such hidden routines among common birds is one of the most rewarding aspects of bird watching, Wood said. Each fall Wood looks forward to watching hordes of jays migrate along nearby Cayuga Lake, where he has been keeping near-daily watches for five years running. In a single morning last year he counted 2,486 Blue Jays, each one patiently flapping southward just above the treetops. “Ironically, we know less about what influences these movements of common birds than we do about something rare like a Cave Swallow,” Wood said. “In late October I’ll be able to look at the weather and tell you when to go out and look for the first Cave Swallow in the Northeast.” But because Blue Jays, flickers, chickadees, and the like are ubiquitous all year, it’s much less apparent when they’re moving. It gets even more tricky with birds like Blue Jays that may fly long distances to gather acorns or other foods, then return to their home territories for the night. Records show plenty of other familiar species move en masse, too: counts of 36,000 Black-capped Chickadees on the Lake Ontario shore in 1961; 5,000 Northern Flickers skirting a Cape May, New Jersey, beach in 1937; 11,000 Cedar Waxwings in Duluth, Minnesota. It’s easy to recognize migration when strange warblers appear in hedgerows or Dark-eyed Juncos show up at feeders. But lots more migration is happening right under our noses, Wood said-if we just keep track (see sidebar). The birds are here all the time, living their lives and waiting for someone to uncover their secrets. If a daily jaunt to your favorite patch doesn’t fit your schedule, you can even start at the feeders right outside your window. Project FeederWatch’s more than 15,000 participants have been fueling scientific discoveries for 25 years. Originally published in the Autumn 2011 issue of BirdScope.